Sprouts Farmers Market Inc (NASDAQ:SFM) stock was hit hard on Thursday following the release of its earnings report for the first quarter of the year. During the first quarter of 2018, Sprouts Farmers Market Inc reported revenue of $1.287 billion. This is an increase over its revenue of $1.130 billion that was reported in the same period of the year prior. However, this was bad news for SFM stock by coming in just below Wall Street’s revenue estimate of $1.29 billion for the quarter. Sprouts Farmers Market Inc notes that its net sales for the first quarter of the year were hurt by a couple of factors. This includes a low supply of produce during the early part of the year. A slight deflation during the quarter also didn’t help the company’s net sales. Earnings per share reported by Sprouts Farmers Market Inc for the first quarter of 2018 was 50 cents. This is better off than its earnings per share of 33 cents from the first quarter of 2017. It also beat out analysts’ earnings per share estimate of 49 cents for the period. Sprouts Farmers Market Inc reported net income for the first quarter of the year that came in at $66.62 million. This is an improvement over its net income of $46.29 million reported for the same time last year. Operating income for the quarter was $79.68 million, which is up from $72.51 million. Sprouts Farmers Market Inc also updated its guidance for the full year of 2018 in its most recent earnings report. It is now expecting revenue growth for the year to range from 10.5% to 11.5%. This is lower than its previous revenue growth expectations of 11.5% to 12.5%. SFM stock was down 12% as of noon Thursday. 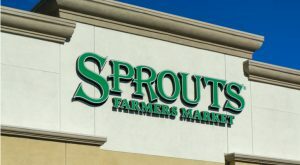 Article printed from InvestorPlace Media, https://investorplace.com/2018/05/sprouts-farmers-market-stock-drops-on-q1-sales/.